Although Jews had lived in Fort Smith since the 1840s, these early residents did not have the numbers to support Jewish communal institutions. The situation began to change in the years following the Civil War, when rapid economic growth attracted many Jewish newcomers to the town. In 1871, community members established a Cemetery Asssociation, which was followed by a Hebrew Ladies’ Benevolent Society and a local chapter of B’nai B’rith. In 1880 a Bavarian immigrant named Simon Joel founded and became president of the first synagogue, Temple of Israel. Sources from the early 1880s reference the existence of two separate congregations at this time, most likely divided along lines of religious observance. 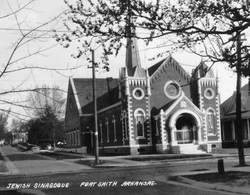 In these early years, members of Joel’s congregation conducted services in a storefront and held confirmation services at the Christian Church of Fort Smith. In 1886, Community members enlisted the help of Rabbi Messing from St. Louis to establish United Hebrew Congregation, which formally joined the two separate congregations. From its inception, UHC aligned with Reform Judaism. UHC members built a large synagogue on the corner of Eleventh and E Streets in 1892. Many prominent citizens attended the dedication ceremony, including Fort Smith’s famous “Hanging Judge” Isaac Parker. 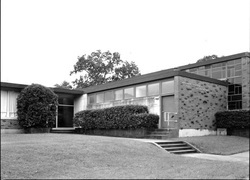 United Hebrew Congregation flourished in the subsequent decades, offering a wide variety of religious and secular activities. In 1907, they had eighty-five members and held services on Friday nights and holidays. They had twenty-five students in their religious school. Their first rabbi was Abe Traugott, who served from 1892 to 1896. Rabbi Edward Levy led the congregation from 1907 to 1914. Rabbi Charles Latz replaced him and became active throughout the region, organizing religious schools and leading services in various small towns in Arkansas and Oklahoma. Sam Teitelbaum was the longest serving rabbi at UHC, leading the congregation from 1927 to 1946. Later rabbis included S. Kleinberg, M. Mann, Alfred Friedlander, Maurice Feuer, and H. Richard White. 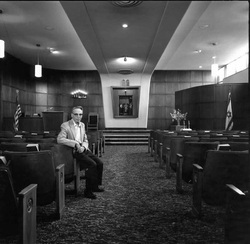 Rabbi Sol Kaplan, who was director of the southwest region of the Union of American Hebrew Congregations, came to Fort Smith to lead services 22 times a year from 1968 to 1974. Since then, the congregation has used student rabbis from Hebrew Union College. In 1913, a group of recent Jewish immigrants from Eastern Europe banded together to form the Orthodox congregation, B’nai Israel. They met in a rented room on Garrison Avenue. The congregation was always small; they would draw about thirty people on the high holidays. Although they never had a full-time rabbi, B’nai Israel owned two Torah scrolls. By the 1930s, the number of Orthodox Jews in Fort Smith had declined, and the congregation found it harder and hard to find a minyan. They finally decided to merge with the much larger United Hebrew Congregation. In the 1930s, UHC welcomed members from the struggling Orthodox congregation, many of whom assumed an enthusiastic and active role at UHC. With only fifty members, the congregation supported a religious school as well as a Temple Book Circle and a Ladies’ Aid Society. During this period, the congregation’s rabbi, Samuel Teitelbaum, took an active interest in the Jewish Student Body at the University of Arkansas in nearby Fayetteville. He helped found a chapter of the Menorah Society on the campus. Many Fort Smith residents helped sponsor the organization. The interest of the Forth Smith community in the neighboring town’s Jewish life was reciprocal, as many Fayetteville residents traveled to the UHC synagogue for holiday services. In 1956, the congregation moved into a modern synagogue at 126 North Forty-Seventh Street, selling the original building to a Lutheran Church. With its new synagogue, the congregation continued to offer a variety of communal functions despite gradually decreasing membership. The Sunday school boasted a staff of five trained teachers, the sisterhood organized dances, suppers, and card tournaments. Many temple members participated in a “Supper Club” led by Rabbi Kleinberg. During these years, the Fort Smith economy began to decline, and many younger residents moved away to seek opportunities elsewhere. In 1970, their synagogue was damaged in a fire. While it was being repaired, the congregation met at the First United Methodist Church. Through the 1980s, the smaller congregation continued to preserve an active Jewish communal life in the town. Every Passover the community Seder drew a large crowd. In 1986, the UHC congregation celebrated its 100th anniversary and prepared a large exhibit of local Judaica, including many artifacts from the early Jewish history of the town. The following year saw the establishment of a museum fund to help preserve this heritage. The community maintained a small religious school until around 2008, and lay leaders continue to conduct regular services as of 2017.